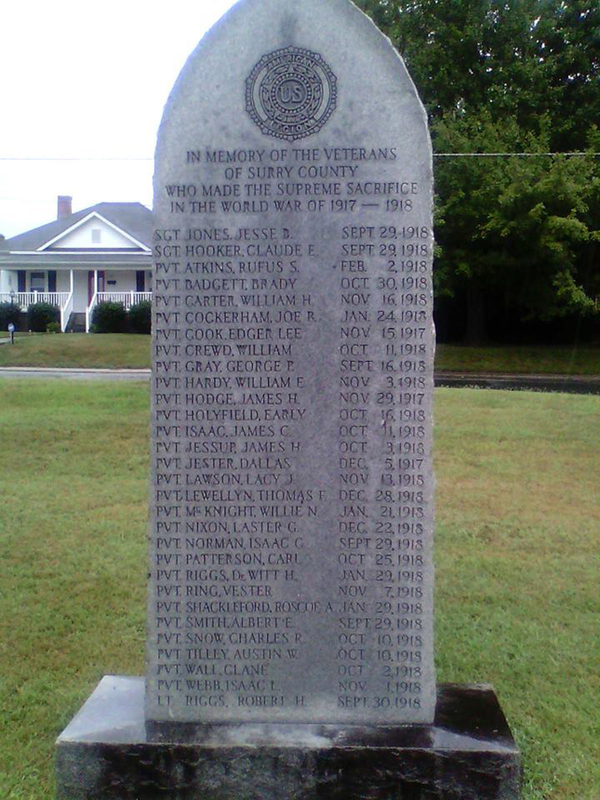 The memorial to Mount Airy World War One dead is a narrow gothic top granite stele four to five feet tall. It stands on a single base with smooth faces and rusticated edges. The American Legion emblem is incised into the front and back near the top. 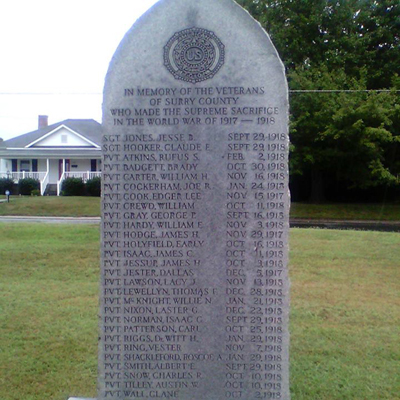 The front lists the names with rank and date of death in a single column. The last name at the bottom was a later addition. The dedication information appears on the rear. The 1940s postcard shows a World War One era German Howitzer next to the memorial. Communities across the United States acquired captured German artillery pieces after World War One from the United States military to use as World War One memorials or to place along with their war memorial. Due to material shortages during World War Two many communities donated these weapons during metal drives. Mount Airy was one of those communities that supported the war effort in this way. Oakdale Cemetery dates to the late 1800’s and is located in the northern part of Mount Airy surrounded by residential neighborhoods. Its 22 acres contain more than 6,000 burial sites. The memorial stands on a grassy area surrounded by gravestones.